Time and time again, as we carefully scrutinize the amazing high-resolution imagery flowing to Earth from NASA’s Mars rover Curiosity, we see weird things etched in Martian rocks. Most of the time our brains are playing tricks on us. At other times, however, those familiar rocky features can be interpreted as processes that also occur on Earth. Now, in a paper published in the journal Astrobiology, a geobiologist has related structures photographed by Curiosity of Martian sedimentary rock with structures on Earth that are known to be created by microbial lifeforms. But just because the structures look like they’ve been formed by microbes on Mars, does it mean that they were? Microbially Induced Sedimentary Structures on Mars? The image in question was snapped by Curiosity of the Gillespie Lake outcrop situated in the Yellowknife Bay area of Gale Crater that the rover arrived at on Dec. 17, 2012, on sol 125 of its mission. It was soon realized that the Gillespie Lake rock is sedimentary sandstone, formed when Mars possessed surface water. As such, there are many likenesses between the rocks found in Yellowknife and sedimentary rocks on Earth. For example, the layering of sedimentary rock and conglomerations contained within these layers led NASA scientists to realize that Curiosity is exploring an ancient lake bed. After 20 years of studying microbially induced sedimentary structures (MISS) on Earth, Nora Noffke of Old Dominion University in Virginia turned her attentions to Curiosity’s observations of Gillespie Lake. 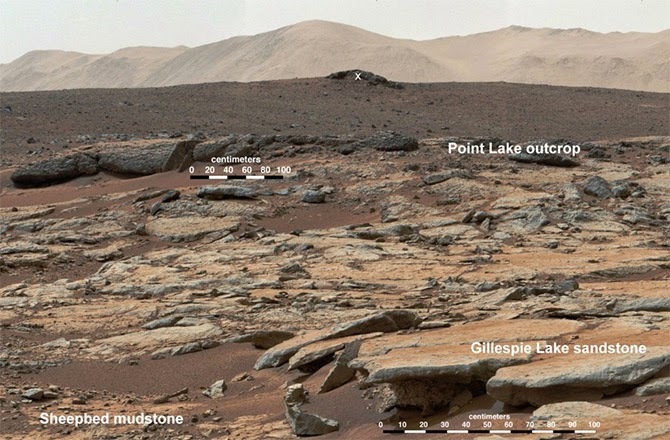 During Noffke’s analysis of the Mars rock, striking similarities in morphological structures in Gillespie Lake and terrestrial rocks were found. Gillespie Lake, which has been dated to around 3.7 billion years old, seems to possess its own structures that could be attributed to ancient Martian microbes. Overlay of sketch on photograph of Gillespie Lake to assist in the identification of the structures on the rock bed surface. In her analysis, Noffke is keen to emphasize that she hasn’t found proof of ancient Mars life, only that her hypothesis provides a compelling explanation for the formation processes behind the shapes in the surface of Mars sedimentary rock. There have been countless claims pointing to evidence of ancient life on Mars, many of which have since been proven to be, at most, wishful thinking, but this new study has garnered some cautious praise from planetary scientist Chris McKay, of NASA’s Ames Research Center and an associate editor of Astrobiology. “I’ve seen many papers that say ‘Look, here’s a pile of dirt on Mars, and here’s a pile of dirt on Earth. And because they look the same, the same mechanism must have made each pile on the two planets,’” said McKay. On Earth, ancient microbial mats — basically sheets of microbes that formed usually in wet environments — can be found fossilized in the surfaces of rock that used to be submerged in water. Noffke studied these fossils on Earth, from a variety of locations around the world, and matched their shape and expected morphology with the shapes on the surface of Gillespie Lake and sure enough, the similarities were there. Unfortunately, this is a problem that continues to dog any effort to find definitive proof of life, ancient or otherwise, on Mars. Mars rover Curiosity is the most advanced machine ever sent to the surface of another world. Its mission on the Red Planet has been unprecedented, providing firm evidence that Mars was once a very wet planet. Also, the mission has detected organic chemistry in rock samples, proving that the building blocks for life do indeed exist on Mars’ rusted terrain. And now, the detection of methane has added fuel to the fire, boosting speculation about methanogens (methane-producing microorganisms) that could be eking out an existence beneath the surface. Albeit compelling, all these lines of evidence for past and present life on Mars are just that, evidence. Curiosity’s mission has never been to find life on Mars — it is there to seek out habitable environments on Mars, past and present. And this is the problem: until we send a robotic sample return mission or, preferably, land humans on Mars, we probably won’t be able to definitively prove that rocky features, such as the ones that cover Gillespie Lake, were produced by microbial life. So what can we do with the assets we currently have on Mars? 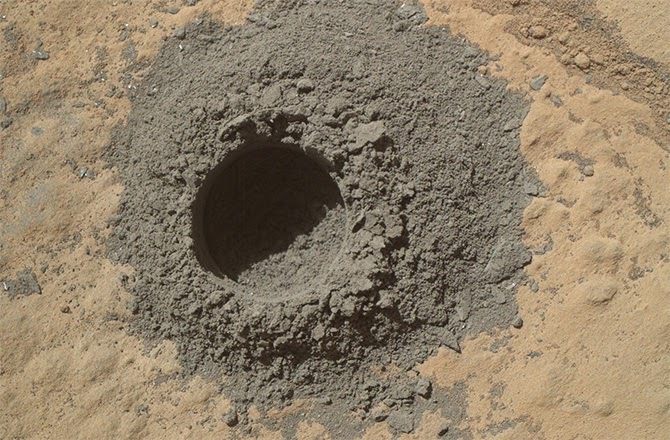 Noffke suggests, that if Curiosity encounters other features that resemble fossilized microbial mats, perhaps the rover could drill into the rock and sample the dust with its on board chemical laboratory, the Sample Analysis on Mars (SAM) instrument. Alas, any biological traces will likely be long-gone, says McKay. To find out whether these structures are indeed biological in nature, samples of rock would need to be thinly sliced and then microscopically analyzed for “specific microbial textures” — a feat well beyond Curiosity’s abilities. So although this new research will likely grab the headlines, and rightly so, we shouldn’t lose sight about what this means. It is not proof of life, it is another line of evidence for the presence of ancient microbial life on Mars. And although this research is compelling, it could still just be Mars rocks tricking us into thinking the shapes are biological in origin.